There are so many shawl patterns to chose from that you could knit up with this gorgeous yarn. 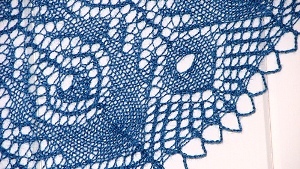 Alison knit the Peacock Feathers Shawl as her second lace project. Since then, she’s gone on to finish dozens of unbelievable lace creations. You can see a few of them on display in the west 10th store. Thanks for the lace inspiration Alison! This entry was posted on Friday, October 2nd, 2009 at 10:53 am	and is filed under Uncategorized. You can follow any responses to this entry through the RSS 2.0 feed. Both comments and pings are currently closed.